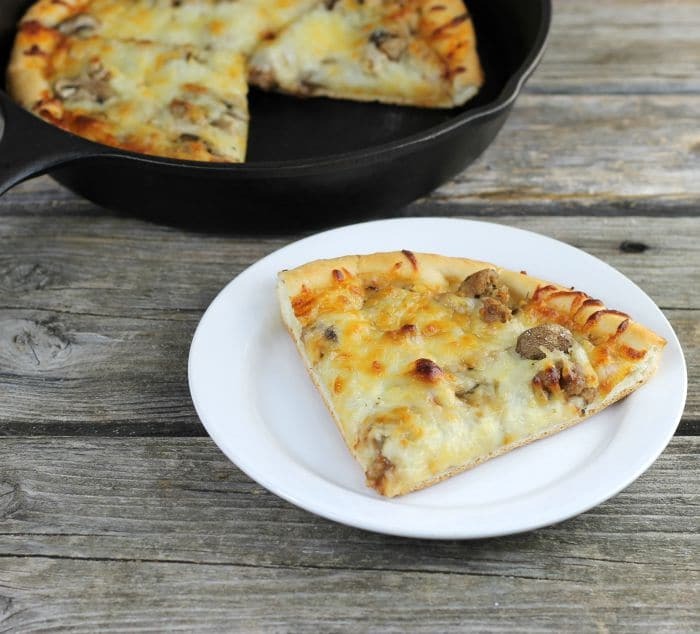 Skillet sausage and mushroom pizza is easy to make and doesn’t take much time at all before it is ready to eat. I have have been making homemade pizza for most of my life. As a kid my mom would buy a box that had the ingredients for the crust and pizza sauce, you added your own toppings. I don’t even know if these exist anymore. After a while, we evolved into making the pizza crust from scratch and making our own sauce for the pizza. (Actually, it is spaghetti sauce that I can every year, but it works well for the pizza. Don’t worry though you can buy your pizza sauce, I would suggest using the recipe for the pizza crust, it is perfect for a 10-inch skillet. The perfect thing about pizza is you can top it with whatever topping you love. In a medium bowl combine the yeast, 1/4 cup flour, sugar, and salt. Add the warm water and olive oil. Mix until the ingredients are well combined. Gradually work the rest of the flour into the dough until the dough is smooth and is just slightly sticky. Let the dough rest for 10 to 15 minutes. 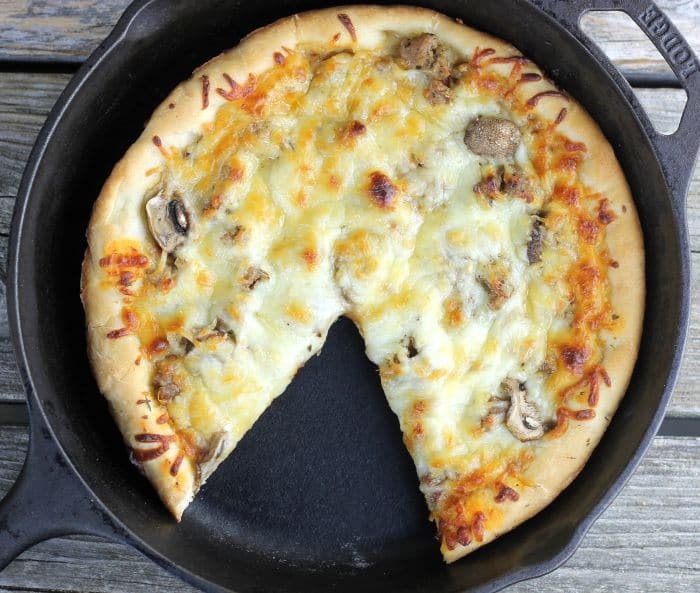 Grease or spray with a non-stick cooking spray a 10-inch cast iron skillet. 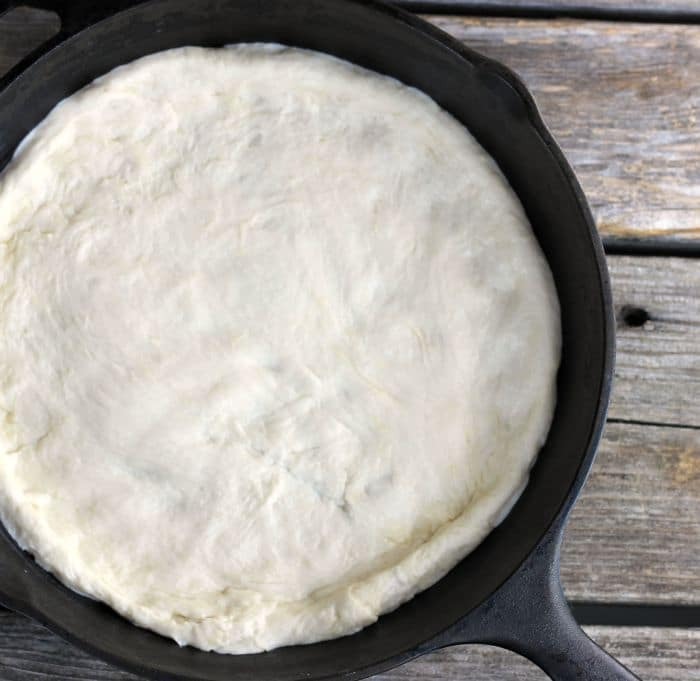 Place the dough in the skillet and with your fingertips spread the dough until the bottom of the skillet is cover and there is a edge around the side of the skillet. Spread the top of the dough with the pizza sauce. Spread the Italian sausage and mushroom on top of the sauce. Sprinkle the Italian seasoning over top of the sausage and mushrooms. Sprinkle the mozzarella cheese on top of the pizza. 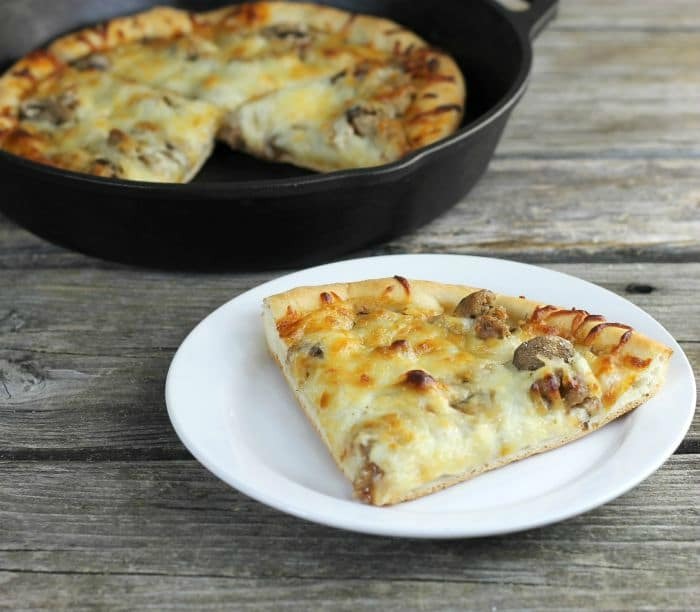 Place the pizza in the preheated oven and bake 22 to 25 minutes or until the edge of the pizza crust is golden brown and cheese is melted and lightly golden brown. I can easily finish the whole pizza at one go! So tempting! I’m just catching up on my favorite blogs after our vacation, and I’m glad I stopped by this post! 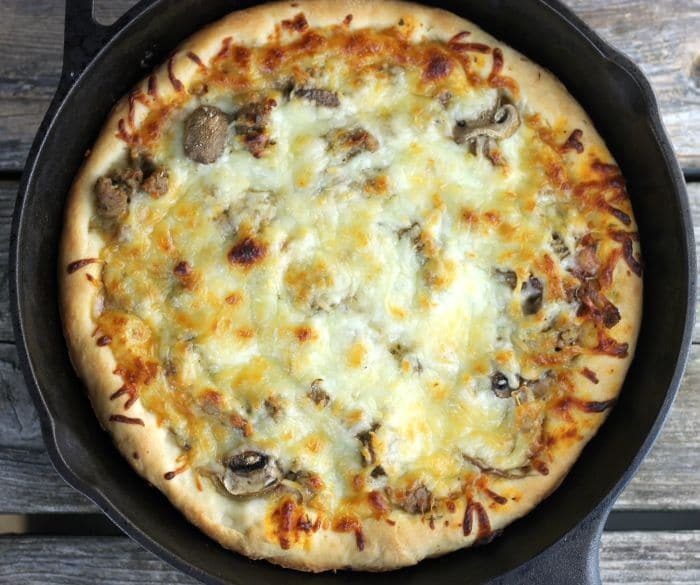 I love a good pizza, and making homemade dough is a game changer. This pizza looks amazing, Dawn! That thick crispy crusted pizza looks great. BTW, I can’t see your complete post. It appears that perhaps the divided left side is too wide so that your right margin disappears off the computer. I don’t know if anyone else is having this problem but I thought I might mention it. Thank you Karen I haven’t had anyone mention this. I will check it out.